Well, we are one week into our latest Stamp Man challenge, there is still time for you to join in as the challenge ends on Thursday at 9pm. I'm only just getting round to adding my entry and chose a deep almost mustard yellow which is a favourite shade. 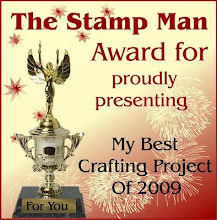 I have wanted to play with the Stampendous Frantage embossing powders so chose the aged gold. The picture above shows this combined with a scrunch Starburst Stain background paper I made a while ago. Normally when I emboss these background papers I gently swipe my embossing pad over the peaks then add the embossing powder to highlight and make texture. This time I poured the embossing powder onto the dry paper and moved it about with my hand until it fell into the recesses. I then carefully heated it from underneath. I wanted to add more texture to the border, so used the same card that was an offcut from the main image. I frayed some white mesh ribbon and coloured it with alcohol inks. I used alcohol inks rather than normal ink as the ribbon has a coating. I love the randomness of Fran's Fran-tage embossing technique, you can see it on the border strip below. I added a bit of bling too, the gold button was nicely textured and I added some gold mosaics, I really must use them more often! So, I hope you will join in with our latest challenge too! As I'm going on about the challenges, I would like to welcome our newest DT member, Kim Reygate. 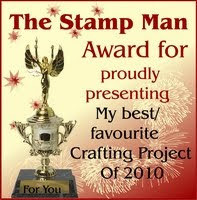 I've know Kim for many many years, she is a very talented card maker and a very lovely lady too. 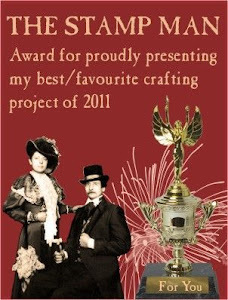 Kim has written a couple of books, one on tea bag folding and the other rubber stamping and is frequently featured in magazines as well as producing artwork for a number of other paper crafting companies. We are proud and honoured to have her on our team. Here's the link to Kim's blog Kim x, you'll find amazing artwork there and I believe Kim is on a mission to blog every day if she can so it's well worth you bookmarking or following her too. We have a new challenge starting on Friday so I'd better get this current challenge card posted and get on with the next one! Fantastic work Jill, just love all the textures and the embossing powder looks amazing.